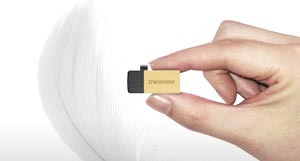 The JetFlash 380 USB On-The-Go Flash Drive transforms how you carry and exchange digital content. 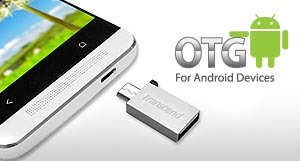 Data can be easily transferred and managed on both Android devices, via micro USB port, and personal computers, via standard USB port. 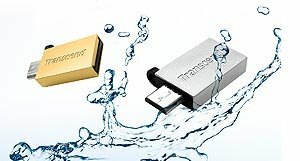 With micro USB and standard USB 2.0 interfaces built into one flash drive, the JetFlash 380 bridges a variety of devices and provides endless storage possibilities. The versatile JetFlash 380 can also be used with any device equipped with a USB port, including TVs, blu-ray players, DVD players, stereos, digital photo frames, and game consoles. For these applications, additional software is not required; all media playback is handled by the device. Increase productivity when working with files on your computer with the exclusive Transcend Elite Data Management software. 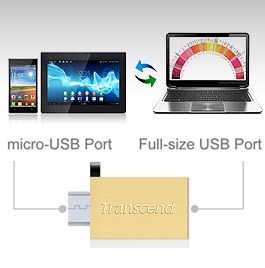 This software can be downloaded and installed from the Transcend website after purchase of the JetFlash drive. With Transcend Elite, you can easily perform incremental backups, compress files with 256-bit AES Encryption, and much more. Engineered using the latest Chip on Board technology, the JetFlash380 is not only significantly smaller and lighter, but it is also water and dust resistant. This compact and rugged design is ideal for users with active lifestyles. 1 Based on file size 2MB. 3 Based on 2.25GB per hour DVD quality. * Please check with the USB port-equipped device manufacturer for exact specifications and supported file formats before using the USB flash drive on the device. Visit Transcend website for compatibility chart. THE 4-PORT USB WALL CHARGER40W 4-port USB charging hub for phones, tablets & more4 port pumps ou..